I was feeling kinda blah after work on last Tuesday. Internally, I debated on attending bible study. My energy level was on low and there was not a burst of rejuvenation in the horizon. My cousin called at the 12th hour to ask if I would be going to church. No, was my response. It required too much preparation. After the phone call, I continued to contemplate going. A quick glimpse at the time and with a small surge of energy, my daughter and I got dressed to go. My pants were wrinkled, my face was oily, and my stomach was rumbling. I didn’t feel like a beauty queen walking out the door. As I sat in church listening to the life changing word being brought forth by Pastor Dio Pouerie, my neighbor across the aisle gave me a note. 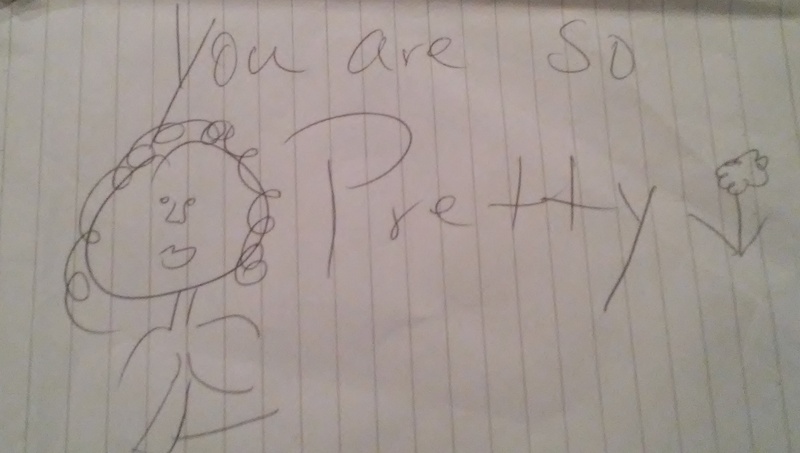 It said, “You are so pretty” along with a hand drawn picture. The gesture was so unexpected. The action totally made my night. It’s the small things that make a huge difference in our lives. People just like to be acknowledged, appreciated, and complimented. 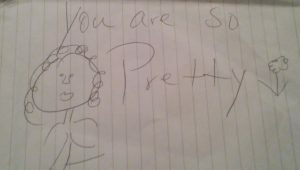 The drawn picture of a girl and a flower was definitely not the work of Picasso (nor Dr. Suess lol), but it was heartfelt. God knew exactly what I needed. Each day practice greeting, commending, or just smiling at people you encounter throughout the day. You never know how much the expression of caring will benefit that person.